The validity of this bold statement from Intelix general manager Cameron Smith was affirmed by a broad consensus of manufacturers observing the latest trends in HDMI distribution products. While one could delve into the specific technical benefits of HDBaseT, the simple truth, Smith pointed out, is that it is a major problem solver for many of the issues that integrators face when implementing an HDMI distribution system. What once took five different cords can now be accomplished with one Cat-5e/6 cable, while supporting high-bandwidth signals like 3D and 4K. From a new product standpoint, Intelix’s DIGIHD70 extender transmits HDMI up to 230 feet using HDBaseT over twisted pair cable. With additional support for CEC, 1080p, 4K, and 3D, the extender is HDCP compliant and features builtin surge protection. The DIGI-HD70 is compatible with Intelix’s FLEX digital matrices for input/ output via a DIGI-HD70 transmitter/receiver. HDBaseT has strengthened the distribution category with all its benefits as well, Vaughan continued, citing uncompressed AV up to 10.2 Gbps, maximum cable length of 228 feet, a standard RJ45 connector, and support for 100 Mbps Ethernet. Leaf’s product line has benefited from performance and design direction from HDBaseT technology, for example with the LTHDMI2020W that features four back-panel HDMI outputs for in-rack or in-room video and audio connectivity. Sixteen HDBaseT LTB1E remote breakout units receive audio and video from up to 52 sources, as well as control data and Ethernet connectivity. “The introduction of this type of powerful product shows just how much HDBaseT technology is helping to shape distribution solutions,” Vaughan said. Featuring HDBaseT Lite technology, Atlona’s AT-PRO3HD44M 4×4 HDMI matrix switcher extends HDMI sources up to 230 feet over a single Cat-6a cable at 1080p. The unit allows bidirectional control through IR remote control, RS-232, front panel, as well as existing third-party IR control boxes and automation systems. Builtin digital audio S/PDIF (Sony/Philips digital interconnect format) loop outs distribute audio to each zone, to an AVR or amplifier. Vanco introduced eight products this year featuring HDBaseT, including an 8×8 HDBaseT Lite matrix selector switch, which offers mirror outputs for distributing to 16 displays in a chassisbased design with removable cards. Transformative Engineering’s “HD-1 Improved” fully utilizes all of the current 5-Play protocols, including full uncompressed HD (1080p) video, audio (including all current Digital Surround formats), 100BaseT over Ethernet, Power over Cable, and various control signals over a single 100 meter LAN cable. Improved features from the previous generation include Power Over HDBase-T, used to power ancillary equipment; simultaneous HEC and ARC transmission; and Power-On-Demand, reducing power usage and heat generation. Crestron’s DM-MD32X32 affords low-latency switching and pure, lossless distribution of HDMI, and other signals to support the latest AV devices. According to HydraConnect president David Schanin, For custom integrators today, “the key issues revolve around physical distribution, and HDBaseT is the right solution for the immediate future because it is reliable technology, and it is plug-and-play technology,” he said. The third-generation HSS-3 system from HydraConnect provides 8×8 switching with eight HDBaseT outputs with PoE, two of which can be configured for HDMI to support local AV receivers. Independent video and audio switching supports AV remix, so users can watch one source while listening to a second. CEC-based control for most TVs, AVRs, DVD players, and IP control for DirecTV receivers eliminates most IR blasters and automation system gear to reduce costs. The HSS-3 fully supports control for Control4, Crestron, RTI, and iRule systems, with Savant support in the works. Kashyap Khetia, product marketing manager, KanexPro notes the greater need for HDMI over Cat- 6 products as AV content is increasingly transmitted at HD resolution. “Furthermore, the recent AACS Adopter Agreement pertaining to copy protection and the gradual move away from unprotected component analog video is encouraging integrators to analyze future AV installations more closely in order to future proof them in support of HDMI,” he said. KanexPro’s latest HDMI extension offering is based on HDBaseT technology. The HDBase70M extender has been engineered for residential application with real-time signal distribution and HDCP management. This extender distributes HDMI signals over a single Cat-6 shielded cable up to 230 feet and supports high resolutions from 1080p to 4K and 3D. The HDBase70M is suitable for designing a series of AV systems in a living room or creating an installer-friendly wiring environment in a home theater. DVIGear’s DVI-TPS-TX90 and DVI-TPS-RX90 form a high performance twisted pair extension system designed for a wide range of HDMI signal distribution applications. The Digital iQ Series of HDMI matrix switchers from Key Digital includes the KD-HD8X8BT with HDBaseT and audio distribution. The device transmits 1080p/60Hz resolution up to 400 feet. When used with a Key Digital receiver baluns and CAT6SP1X, 1080p/24, 1080i, 720p, and 480i resolutions can be transmitted up to 600 feet. 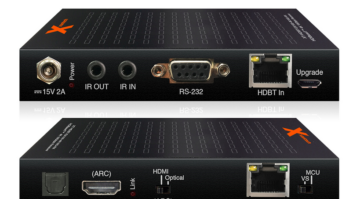 Uninterrupted switching and viewing of any source/ input with any display/output is possible with Key Digital’s fully buffered matrix technology regardless of multiple output viewing relation. Full audio control per each of the 16 active outputs (8HDMI/ DVI and 8 Cat-6/STP) is achieved for volume, treble, bass, balance, and lip-synch for two-channel stereo formats from analog or digital sources. HydraConnect’s Schanin believes fiber optic signal distribution will become more of a future trend as costs come down, while others expressed more confidence in its viability right now. For instance, a FPGA (field-programmable gate array)-designed front end extends HDMI, RS232, and IR over a fiber optic link for distances up to 1,000 feet. “Using a cross-point matrix, routing HDMI through the whole house can now be achieved easily using either the HDBaseT or the fiber optic extension technologies,” said Gefen president Hagai Gefen. The GefenPRO 8×8 HDMI matrix w/4 ELR (extra long range) extender offers a versatile solution for high definition video integration and HDMI extension in one enclosure. Gefen also identified video over IP technology as a trend for 2013, routing signals over a local area network (LAN). “With this technology, a gigabyte Ethernet router/switch can be used to route Cat-5 cables through the LAN, extending up to 330 feet from and to each sender and receiver unit. Multiple senders and receivers can be used to transport HDMI, USB, audio, RS232 control, and IR over the LAN,” Gefen said. The GefenPRO 8×8 HDMI matrix w/4 ELR (extra long range) extender offers a solution for high-definition video integration and HDMI extension in one enclosure. Up to eight HDMI sources can be routed to any eight displays located either close to the source or up to 330 feet away. High-definition resolutions up to 1080p full HD with 3DTV pass-through and multi-channel audio are supported from source to display. Intelix’s DIGI-HD70 extender transmits HDMI up to 230 feet using HDBaseT over twisted pair cable, with additional support for CEC, 1080p, 4K, and 3D. Celerity Technologies’ detachable fiber optic HDMI cables require no external power adapters or extenders. Available in lengths starting at 40 feet up to 1,000 feet, the product is designed for single and multiple room HDMI connections where distance between the source and display is extended. Celerity supports 3D, 4K, and Audio Return Channel (ARC) without loss of signal integrity and HDMI specification, the company says. Audio transport capabilities are a big trend for Crestron as well, according to Mike DiBella, solutions manager, in addition to HDBaseT and fiber transport. “Concern about HDMI’s audio transport capabilities is moving to the forefront, as more demand is being placed on manufacturers to expand distribution over Cat-5e, multi-mode, and single-mode fiber,” he said. Crestron’s experience facilitating audio transport over HDMI includes its DSP downmixing and Free-Run audio capabilities. “Our DSP downmixing converts a multichannel audio stream into a two-channel stream without affecting signal quality, so surround sound audio can be sent to one room while the same content is enjoyed in twochannel stereo in another,” DiBella explained. While HDBaseT seems to have cemented its place as the HDMI distribution technology going forward, there are a range of predictions about where, exactly, manufacturers will take it. For DVI Gear, the trend is manifesting itself in product design with point-to-point extenders and HDBaseT I/O cards for the Multiport matrix switchers in the works. Currently, DVIGear’s DVITPS- TX90 and DVI-TPS-RX90 form a highperformance twisted pair extension system designed for a wide range of HDMI signal distribution applications. DVI and HDMI v1.4-compliant signals can be reliably transmitted with or without HDCP encryption over a single Cat-X cable up to 590 feet. These units support 4K resolution, 48-bit color depth, and all 3D signal formats. Additional signals such as bi-directional RS-232, IR, and Ethernet pass over the same Cat-X cable.